Sometimes I get overwhelmed by generous PR samples. I received all 10 shades available plus the new oval brushes. (It feels, however, somewhat wasteful because I find only a couple shades suit me. If you're interested in trying the other shades, do let me know.) The color range is rather great covering palest to deepest and it has a good mix of warm and cool shades. For myself, the lightest shade Porcelain is the best match. (For your reference, I am about MAC NC15 but can also wear NW15.) Porcelain is a pale neutral color that has equal parts of yellow and pink, in my opinion. I compared the two lightest shades, Porcelain and Light. Light is about a shade darker than my skin tone and has more beige in it. Interestingly, the color kind of adjusts once I apply it on my face and ends up looking quite natural, so I've decided to keep both shades for myself. 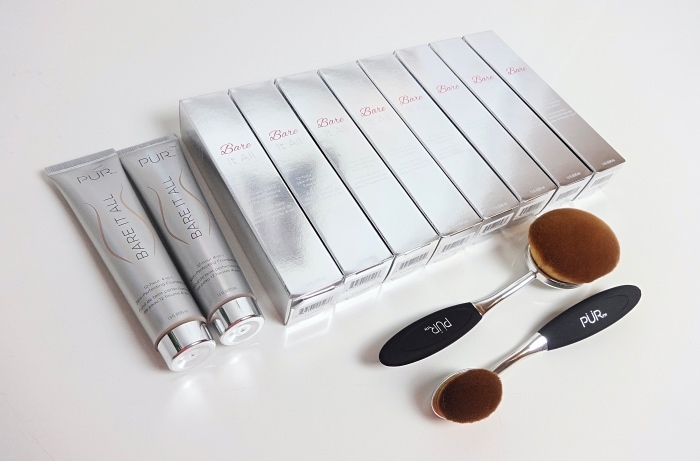 According to PUR website, the new Bare It All Skin Perfecting Foundation is a long lasting demi-matte foundation with high coverage. I've tried it using the suggested foundation brushes, my fingertips, and a conventional foundation sponge. The foundation blends in flawlessly regardless of the application methods. It instantly covers everything (well, maybe not my beauty marks) and my complexion becomes kind of "high-definition" (I don't know how else I could describe it). 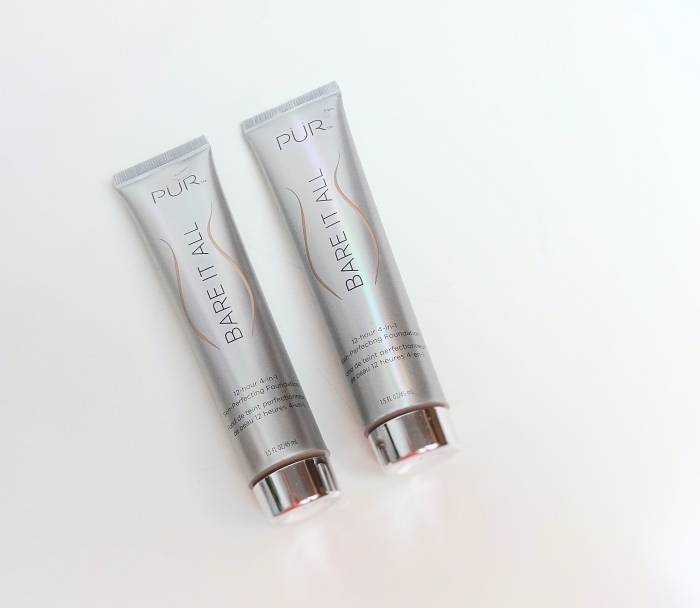 It is remarkable that PUR Bare It All lasts throughout the day without darkening, yet it feels very very comfortable on. It definitely doesn't feel like a full coverage foundation on skin. 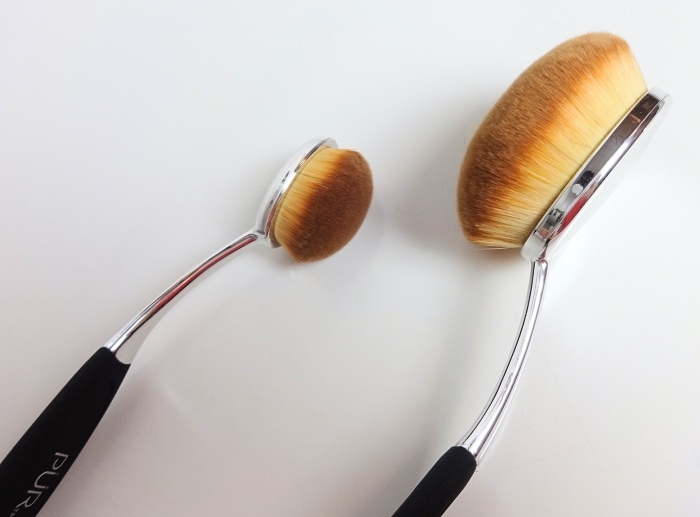 I've been interested in trying these oval-shaped brushes for some time now. These are really well-made, so dense and soft! The big brush is intended for face and body application, but I think maybe it is a bit too large to work on every detail. I find the small one works just fine for face application although it is meant for concealing and contouring. I can achieve the highest coverage when I use these brushes to apply the foundation. 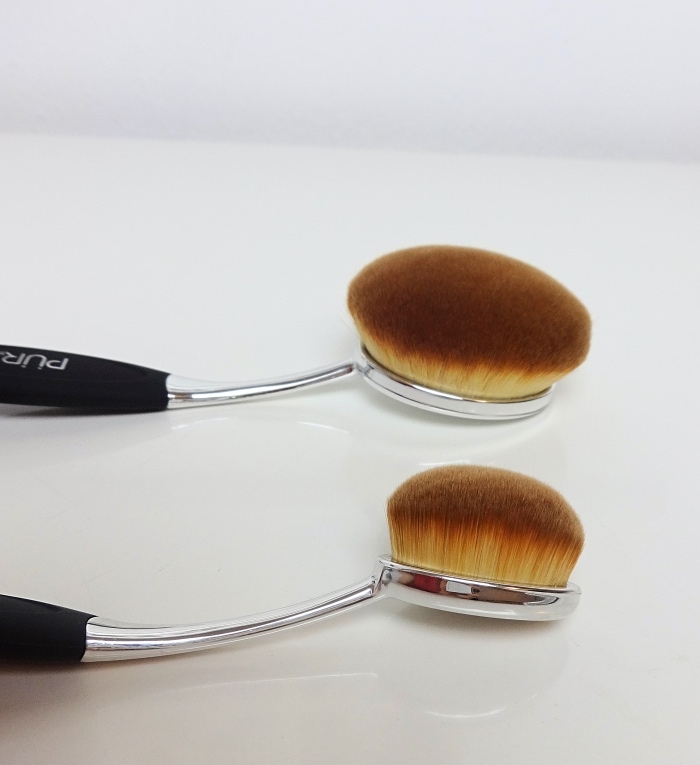 My favorite way to apply Bare It All is, however, to use fingertips first then buff it out using these brushes. 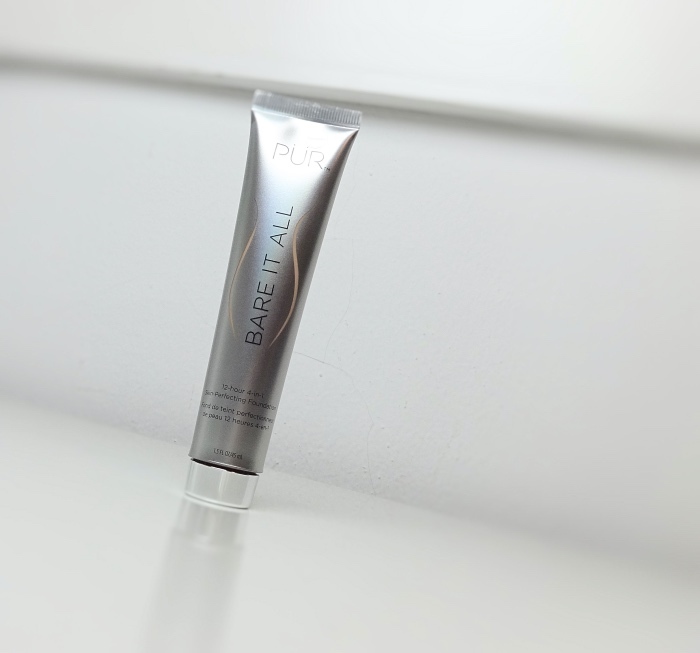 This ensures a smooth even finish without any blotchy spot! I do wish the foundation was unscented and maybe came with a better cap (it doesn't screw as smoothly). It is a pretty darn good foundation despite a few little things, though. It is probably the most natural looking full coverage foundation I've tried. More importantly, it feels good and even nourishing on that I see myself continue to wear it for months to come. 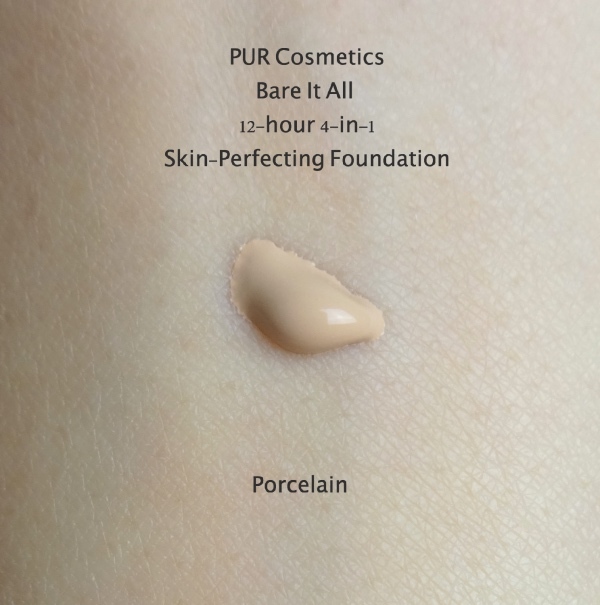 PUR Bare It All 4-in-1 Skin Perfecting Foundation is available at retailers like Ulta ($39 for 1.5 oz). 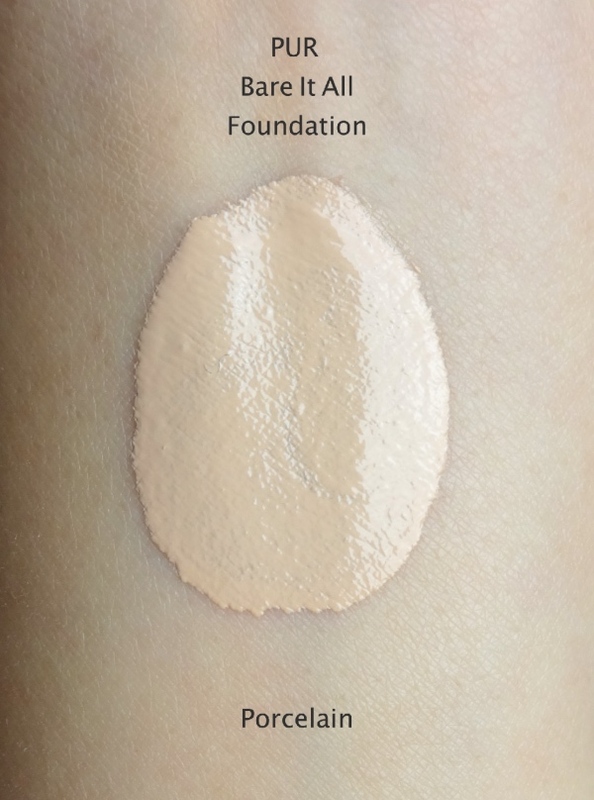 I remember when full coverage foundations used to feel super heavy and uncomfortable to wear so it's good that the technology has come so far. Sounds like you found a winner with this one Lena, especially since the coverage is also natural looking. I can see why the cap would be cumbersome to use. They should've at least went with a flip cap to make it easier to use. I am wearing liquid foundation today and although this is my all time favorite I kind of miss the coverage that Bare It All gives! I like that this one seems to be kind to my skin, too. But as you said, I would have loved it even more if it came with a flip cap. It just doesn't have great ergonomics. 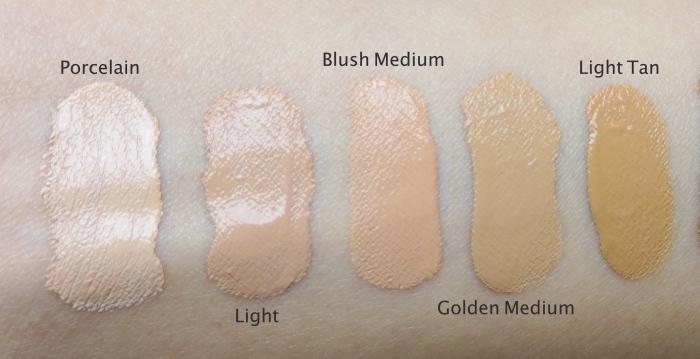 I can't really tell from the swatches what the difference between light and blush medium is. Does Blush Medium pull more pink when applied to the face? I'm neutral with a touch of olive, which means I usually can't pull off anything as warm as Golden Medium. Oh no worries about the swatches at all. I'm just a bit gun shy after some bad oxidizing experiences. Thanks so much! 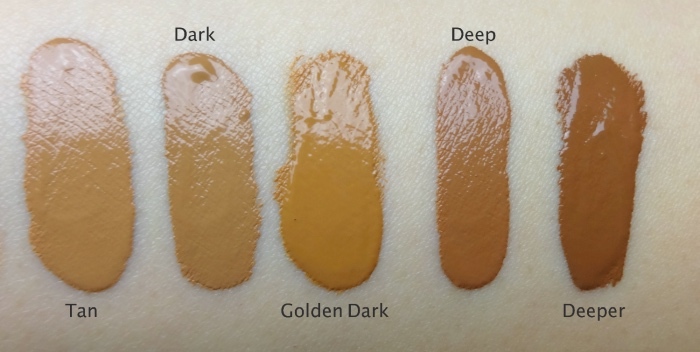 *oogles swatches* I think that I'd be closest to Golden Medium? LOL. I don't think that's something that ever can be forgotten, Liz! Oh it's fab to hear about a full coverage foundation that actually feels good! I'm probably the porcelain shade as well. I'm totally intrigued by those brushes as well. I sadly have no brushes after my Bare Minerals brush basically disintegrated and have to start getting some brushes again! 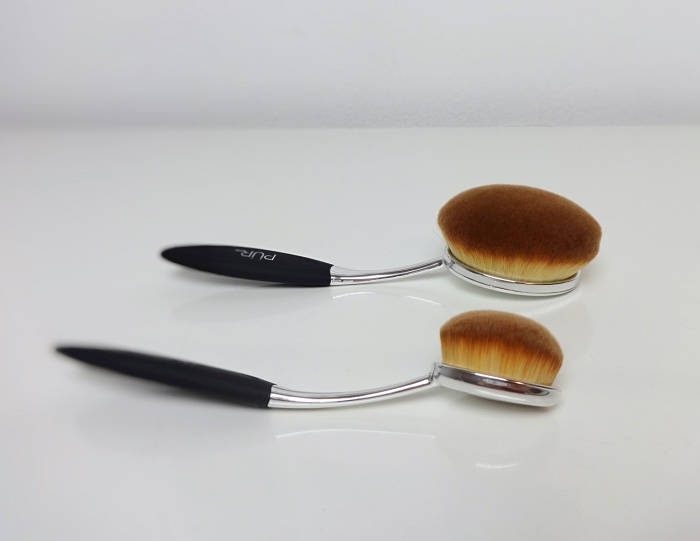 I'd still invest in classic brushes if I have the money, but I was super curious about these oval ones. It's amazing how soft they can make synthetic brushes nowadays. I still need to figure out the best way of using them, but they sure are great for buffing and blending.